I don't like texting. When I do, I have to write everything out and it takes so long. I guess I'm just not used to it and it drives me crazy having to shorten words. I prefer email. 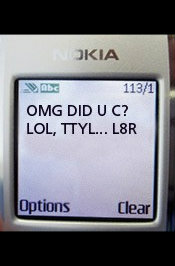 I think children should learn to read and write properly before venturing into texting. So do you think Text Messaging is ruining the English Language? Do you prefer texting or email? or other? When I write texts I also write out everything! :) I prefer to write emails and rarely write texts. I would not be surprised if text messaging is ruining the English language. I wonder what research has revealed about this. That reminds me that this morning one of my phone companies gave me 100 free texts just for being a customer. I doubt I will use many of them. Take care and enjoy the rest of your day. My android suggests words for me so it is actually easier to use the actual words than abbreviations. Talking is much faster but texting is convenient when communicating across the world, for example I have blogging friends who live overseas I can g-chat with on my lunch break - that is kind of like texting. 1) No, I don't. I type out everything. My kids do not like abbreviated words either (example: 2 for too or two). They think that "people who use slang language think of themselves as smarter or cool to come up with such abbr - which they do not agree. They are actually the tougher critics than I. 2) I like texting and email, because I like to get the point across asap. Or when time permits. Texting is fast on the iPhone, especially with Suri, just talk into the phone and she types out everything. The keys on the iPhone are so much smarter the HTC Evo Android I used to have. I say the iPhone is not any different than email or my laptop. Your next phone, may I suggest the iPhone? Smiles. Have a great weekend! I don't think it's ruining the language, really. The ones who won't write properly wouldn't have regardless, IMHO... I love texting. I'd much rather answer a text than a phone call! ;) Aloha! I don't think it's ruining the language, but I do hate text messaging and their word shortcuts. Email and chat are way better but I also don't love answering calls. I have seen scholarly papers before that had LOL, or ROFL written in them (seriously) and all I could think was...really?? I think there's a time and a place. My daughter would text 24/7 if I let her. I agree Rosey that there is a time and place! And we should always practice to write and speak properly! I like texts for quick hit things like: when coming home? where r u? or remind me ... I do tend to still spell them out though. I have never sent a text. I'd rather talk to the person or message on FB or send an email. I type everything out too although my husband, who speaks and writes with perfect grammar and spelling, does the little text words. Ha! Good gravy I hate when kids butcher the English language like that. Especially when they think we understand it. I love texting more than talking from time to time (if its to ask a question) but I think kids need to learn to WRITE before type..
Hi Colette ~~ We do both text and e-mail. Probably more text than e-mail and fortunately all our kids use regular school learned English. We text our daughter in London, U.K, with the free Apple text that comes with the iPhone, iPad, etc. Then with the others and the grandkids we have unlimited text on our family plan. As long as the schools are doing their jobs the English will be here to stay. Writing skills too. In a way, texting is affecting the language and how we use it. I am ok with texting for a brief period. I prefer talking and get it over it..